Thanks to Shelley from Indiana for an email that inspired this post! Please never hesitate to get in touch with me: ian@byrdseed.com! They always went beyond my expectations, not simply in terms of quality, but because of their divergent, unexpected thinking. But how do we reward our students’ clever thinking? Typically a “good job” is rewarded with a high grade. But there’s no “unexpected idea” or “amazing artwork” box on the report card. If students’ thinking or effort is extra amazing, how do I recognize those students? My solution was to put the problem into my students’ hands through a vote. I would create a few categories (which changed depending on what I saw students producing) and ask for votes. 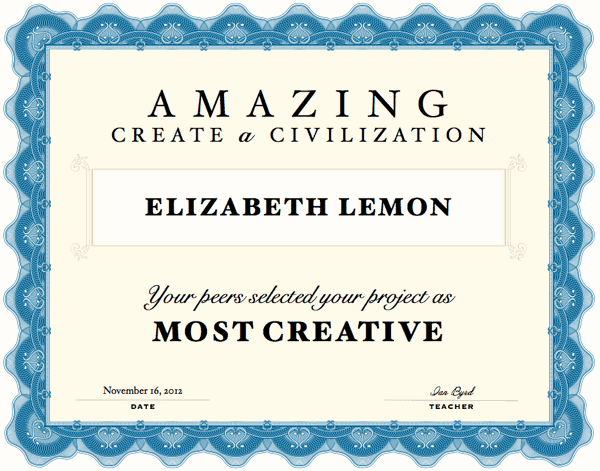 I’d count up the votes and print nice, color certificates for each winner. If three kids were very close, I’d give it to them all. If one person dominated everything, I’d give them a “Best In Show” award, and let the second-place winners have the other certificates. In other words, don’t remove yourself entirely from this process. Pro Tip Tell students they can only vote for a person once. This can lead to some very interesting results as students ponder: Was Carrie’s project the Most Creative, or the Most Detailed? The result: students who went beyond academic requirements were recognized and rewarded by their peers in a way that honored their effort. This sample was made using the built-in template from Apple’s Pages. You could do the same with Word or even Powerpoint.